After a few sleepless nights, we are now finally done moving all our content from FileFront to our new host warumdarum.de. Before we say anything else though, we would like to give a warm 'Thank you' to our long time supporter and owner of our new host Fl�stert�te and AndyGr42, without whom such a speedy transition would not have been possible. They have been a great help, not only with our website and developer forum, but also with our brand new public forum. We would also like to thank FileFront, for the past 5 years our reliable host. It is a real shame such a great community has so suddenly disappeared, but some of the old forum staff is already working on a new forum. We will of course keep you up to date on these events as we learn more. Last but not least, we also want to thank all those in the Forgotten Hope community who have offered to host our website and forums. We have received dozens of offers and we really appreciate that so many people would want help us out so quickly. We hope you will enjoy our new forum and, as usual, feel free to join our IRC channel to discuss this announcement. As of yesterday evening, the entire FileFront forum and consequently also our Forgotten Hope forum were taken offline permanently, without warning. Due to the current economic recession, Ziff Davis, the owner of FileFront, has decided to indefinitely suspend all of FileFront and related sites. Unfortunately, this also includes bf1942files.com, on which the Forgotten Hope website is hosted. Whereas the forum is already gone, FileFront users are given until March 30th to download any files they may have hosted on the site. This means that as of March 30th this website will go down. We are currently in the process of finding a new place for our website and forums, but until then we have created a blog, which you can find here. We will continue to keep you posted on the development of Forgotten Hope 2 on our new blog until we find a new place for our website. If you have any questions, please visit our IRC channel and we will try our best to answer them. Please note though, that none of us was informed about this decision and we were not aware what happened until earlier this evening. Hello and welcome back to another update of Forgotten Hope. Today we have an advertisement for the new Forgotten Honor Campaign, which starts today! After months of preparation Forgotten Honor is ready to present to you a new theatre: Italy. Over the last 3 months our team of almost two dozen mappers, moddelers and graphic artists have worked on this campaign so that every single map will have that unique Italian feeling. There will be no reused old maps with a few minor changes. Each map has been made from scratch using actual battle plans and geographical data from the period. Italy is very different from Africa. Hilly terrain and dense vegetation provide many flanking opportunities and the introduction of new hand held antitank weapons finally allows infantrymen to effectively fight off enemy tanks. Every week until the campaign ends we will release a new map and each Friday a 64 player battle will take place. Players will be divided in two teams, with a command structure based on actual World War II units. No previous experience is needed and everything is completely free. Just click on the picture below, join and enjoy Forgotten Hope 2 on an organized level. Brand new, unseen maps, following a historically accurate storyline that will recreate in depth the Battle for Italy. From the beaches of Sicily to the fall of Rome. 32 vs 32 battles every Friday night. England based server with good ping for players from both USA and Europe. Team play on the highest possible level. Two armies lead by experienced and respected officers. An original World War 2 chain of command with a complete rank system. Earn medals for your personal and team accomplishments. A unique atmosphere created by a very active and friendly community with people from all over the world. All that and much, much more, completely free. That's all for this week, but be sure to come back next time for another update. Until then, feel free to visit our IRC channel and our public forums to discuss this update and other news. Hello and welcome back to another update of Forgotten Hope. 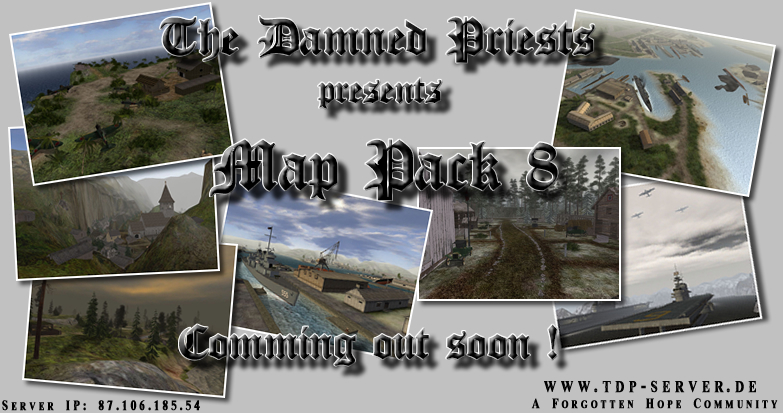 Today we have an advertisement for The Damned Priest's Mappack 8 for Forgotten Hope 0.7. Hello and welcome back to another update of Forgotten Hope. Today we have renders of our Canadian player models and of some new weapons for our Normandy Theater of War. Before we show these though we would like to thank everyone who voted for us in the ModDB mod of the year awards. We didn't get as much votes as last year, so we only received an 'honourable mention', but it's still nice to know that we rank among the best mods out there. We would of course also like to congratulate our Battlefield 2 modding colleagues at Project Reality for winning both the ModDB player's choice "Mod of the Year 2008" and the editor's choice "Best Multiplayer Mod". 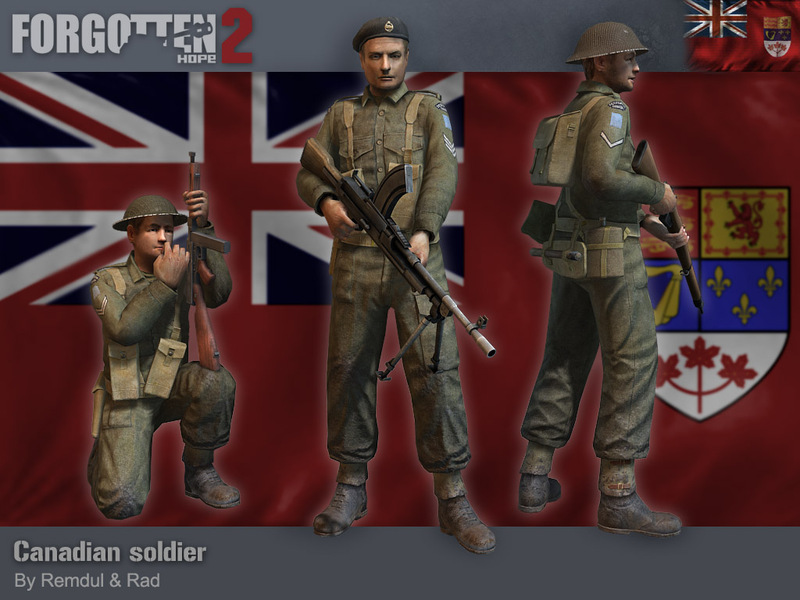 First up for today's update then are the Canadian playermodels, which are reskins of the British player models shown in our last update. Like the British models they were made by Remdul, based on the British Africa player models by Rad. Next up are the new weapons. On the allied side we have the M1911A1 .45 Caliber Colt. This pistol was made by Remdul and PointBlank86. The M1911 Colt was adopted by the US military in 1911, but it was not until 1985 that it was replaced as the standard issue sidearm. Some US military special forces groups still use the M1911 or weapons based on the M1911 today. 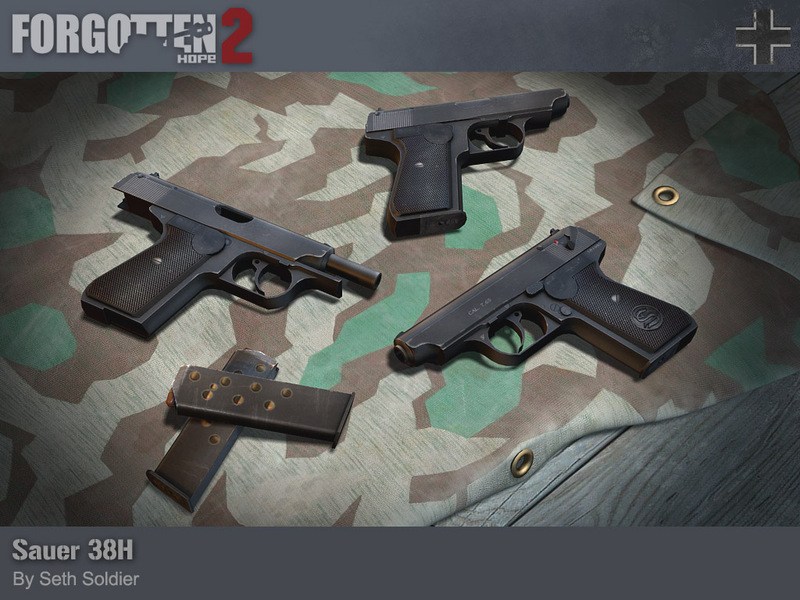 Over 2 million of these pistols were produced. 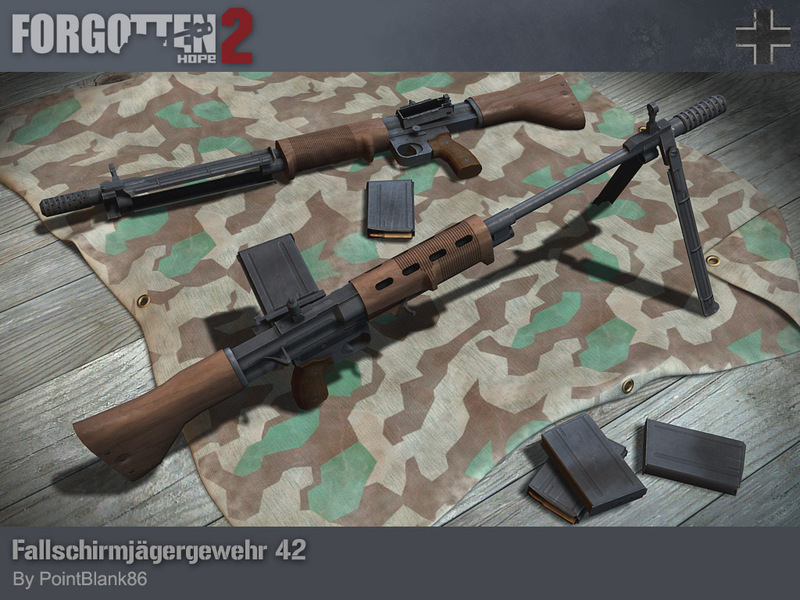 Finally we have some German Fallschirmj�ger weapons. 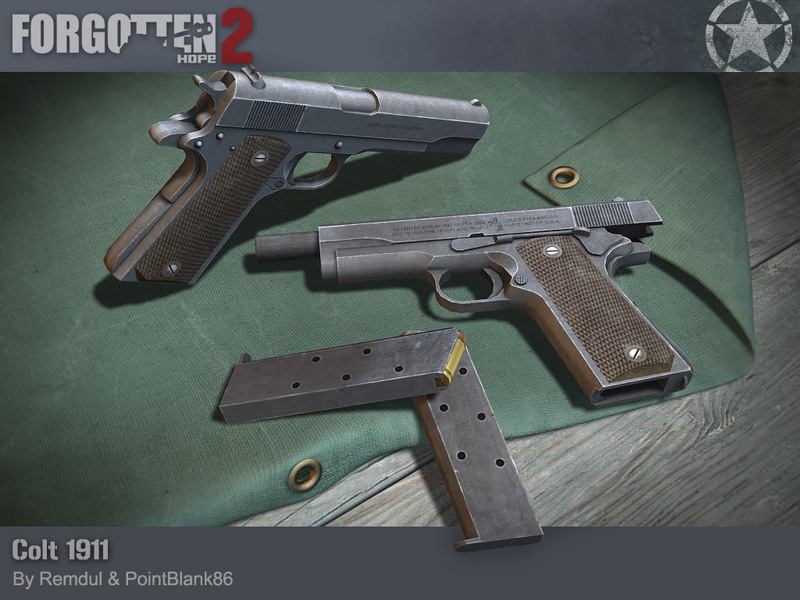 On the left is the Sauer 38H pistol, made by Seth Soldier and on the right is the Fallschirmj�gergewehr 42 (FG42) by PointBlank86. The Sauer 38H is one of the lesser well-known German pistols of World War 2. Approximately 200,000 of these pistols were produced from 1938 to 1945 and were mainly used in the German Luftwaffe and by police forces. In Forgotten Hope 2 you will mainly see this weapon with Fallschirmj�ger and in pilot pickup kits. The Fallschirmj�gergewehr 42 was nowhere near as common as the Sauer 38H, yet it is quite a well-known weapon. Only 7,000 of these rifles were made. Although the name would suggest this weapon entering service in 1942, it wasn't until September 1943 that it was first used. In practice, the FG42 was a disappointment. It's design was too complex with too many moving parts, causing it to jam easily when dirty and it's side-mounted magazine caused a recoil that was hard to control.